Carlos was one of the founders of NewsTaco. His legacy and vision for a change of the U.S. Latino narrative live here still. In the 1960s, Texas A&I University (now Texas A&M University-Kingsville) was a hotbed for political activism. The campus was the home of several Mexican American civil rights organizations. 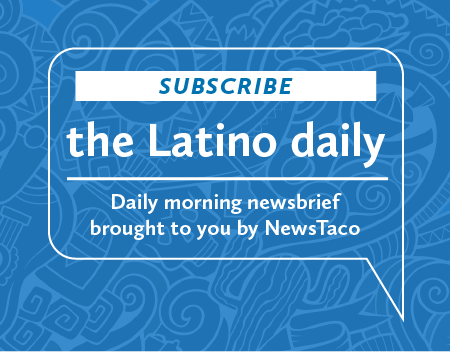 Among them were La Raza Unida, the Mexican American Youth Organization (MAYO) and the Political Association of Spanish-Speaking Organizations (PASSO). All were focused on stopping discrimination against Mexican Americans and in promoting the goals of the Chicano Movement. At the time Carlos Guerra, a native of Robstown, was a student at the campus nestled on the western outskirts of Kingsville, near the King Ranch Headquarters. The son Robstown restaurant operators, Guerra developed into one of the iconic civil rights leaders for a generation of Mexican Americans who wanted to change the world and were willing to march, speak and get involved in politics no matter the cost. Guerra, who went on to become a syndicated and award-winning columnist for the San Antonio Light and later the San Antonio Express-News, was at the forefront of this battle. He would become national president of MAYO and active in every aspect of the Chicano civil rights struggle, nationwide. In South Texas, he organized countless marches, protests and rallies against discrimination. The most notable were in Kingsville, Raymondville and Pharr-San Juan. The Pharr-San Juan protest in March 1971 gained nationwide attention and was the focus of a New York Times article explaining the Chicano Movement in South Texas. While he was a student at A&I, Guerra was an award-winning debater and a columnist for the university’s student newspaper, The South Texan. He was also outspoken and was often criticized for his stances and belief that Mexican Americans were not treated with dignity and respect in Texas, especially in South Texas and the Rio Grande Valley. He wrote about this in the column he penned weekly for the university’s student newspaper. His column was titled “Guerra’s War.” In his first column he lambasted the Texas Rangers. By the end of the summer, he was told his services as a columnist were no longer needed. No matter, he started an underground newspaper that covered campus and community news. The New York Times article on the Pharr-San Juan protest described him as “a slightly built man with shoulder‐length hair and a disarming smile.” But Guerra was a commanding speaker and his speeches on the Kingsville campus and elsewhere had such energy that it would motivate others of join the struggle for civil rights. Taking cues form Martin Luther King and Cesar Chavez, Guerra was the master of the peaceful political protest organizing marches that were well-controlled and did not condone violence. During the Gillett Middle School walkout in Kingsville in 1969, he and other A&I students organized a protest that resulted in several students being jailed. The students had submitted a list of demands to school officials that were ignored. Those demands included: no punishment for students who demonstrated for better education; no punishment for speaking Spanish; books about Tejano and Mexican American heritage in school libraries; more bilingual and bicultural programs; teachers stop taking political sides and preaching them to their students; an end to the racist literature that erased the contributions of the Mexican Americans from the pages of history; and more Mexican American teachers, administrators and especially counselors. These were demands that corresponded with MAYO’s goals. Guerra, who was national president of MAYO, and his A&I friends were ready for the protest. The students walked out and rallied at the flagpole in front of the school. Guerra then walked up and took the U.S. flag down and replaced it with a red flag of MAYO, reminiscent of the United Farm Workers flag. There were jeers and cheers, but no one was hurt. When an older non-Hispanic white gentlemen, a custodian at the school, walked up to the flagpole and took down the MAYO flag, the students encouraged Guerra to stop him. He simply said, “no.” The message had been sent. The protest was over except for the roundup of students by police. Upon graduation from A&I in 1969, Guerra would pursue various careers, but his love was journalism. He became part of the San Antonio Light’s editorial department. He was a front-page columnist for the Light for two years before it ceased publication. He then moved to San Antonio Express-News and served as its metro columnist for more than 18 years. His work was syndicated in other newspapers throughout the nation. He also helped organize the nationwide blog and Facebook site NewsTaco that reported on nationwide Mexican American affairs. His last Facebook posting the day before his death was about the need for immigration reform and about students at the San Antonio on a hunger strike for the DREAM Act. Guerra also worked for several philanthropic foundations on the East Coast and traveled extensively throughout the United States and Latin America. Guerra was one of the first Americans invited to travel to China after World War II. He also traveled to Cuba twice and personally visited with Fidel Castro on issues affecting the hemisphere and the United States and Cuba relationships. During his time attending Texas A&I, there was much discrimination against Mexican Americans in South Texas. Guerra stood up for change not only at Texas A&I, but in the region, the state and nation. He remained active in the state and nation’s civil rights movement through the 1980s and was a pallbearer at famed labor leader Cesar Chavez’s funeral in 1993. Guerra and MAYO brought many changes to A&I, Kingsville and South Texas. Among their accomplishments was urging then A&I President James C. Jernigan to successfully push for an open-housing ordinance in Kingsville and Kleberg County. Guerra was heavily criticized for that and pretty much was “pesona non-grata” in the city for a while. In a twist of irony, the Kingsville city commissioners would later present him a “key” to the city and Texas A&M University-Kingsville would name him a Distinguished Alumni. Guerra always credited the education and experience he had on the Kingsville campus as the impetus for his civil rights activities and the success of his journalism career. He would often visit student journalists at A&M-Kingsville and remind them of the importance of their work and career. Guerra was found dead Monday, Dec. 6, 2010, in a Port Aransas condominium. He was 63. Before his death he helped endow a scholarship for South Texas student journalists at his alma mater, raising more than $35,000 in one fundraiser. More than 16 student journalist at Texas A&M-Kingsville have been recipients of the scholarship thus far. The scholarship will ensure his legacy lives on. Manuel Flores is a journalism professor at Texas A&M University-Kingsville and a former Caller-Times reporter. Tejano Talks is a column on South Texas history and Tejano heritage and culture. It is produced by the Tejano Civil Rights Museum and Resource Center in conjunction with the Caller-Times and A&M-Kingsville.